حسینی, سید بهنام, حجازی, سحاب, جمالی راد, لعیا, فتاحی امین, مینا, ایزدیار, سهیلا. (1396). بررسی مقایسه های اثر باگاس و کلش برنج تیمار شده روی ویژیگی های فیزیکی و مکانیکی چند سازه های تقویت شده با الیاف طبیعی. مجله صنایع چوب و کاغذ ایران, 8(3), 453-469. سید بهنام حسینی; سحاب حجازی; لعیا جمالی راد; مینا فتاحی امین; سهیلا ایزدیار. "بررسی مقایسه های اثر باگاس و کلش برنج تیمار شده روی ویژیگی های فیزیکی و مکانیکی چند سازه های تقویت شده با الیاف طبیعی". مجله صنایع چوب و کاغذ ایران, 8, 3, 1396, 453-469. حسینی, سید بهنام, حجازی, سحاب, جمالی راد, لعیا, فتاحی امین, مینا, ایزدیار, سهیلا. (1396). 'بررسی مقایسه های اثر باگاس و کلش برنج تیمار شده روی ویژیگی های فیزیکی و مکانیکی چند سازه های تقویت شده با الیاف طبیعی', مجله صنایع چوب و کاغذ ایران, 8(3), pp. 453-469. حسینی, سید بهنام, حجازی, سحاب, جمالی راد, لعیا, فتاحی امین, مینا, ایزدیار, سهیلا. بررسی مقایسه های اثر باگاس و کلش برنج تیمار شده روی ویژیگی های فیزیکی و مکانیکی چند سازه های تقویت شده با الیاف طبیعی. مجله صنایع چوب و کاغذ ایران, 1396; 8(3): 453-469. در این پژوهش اثر ماده لیگنوسلولزی بر ویژگی های فیزیکی و مکانیکی چند سازه های چوب پلاستیک مورد بررسی قرار گرفت. برای این منظور ماده لیگنوسلولزی در چهار نوع آرد خمیر کاغذ های سولفیت قلیایی- آنتراکینون، مونو اتانول آمین، سودا - آنتراکینون و شیمیایی - مکانیکی با پلی اتیلن سنگین (HDPE) مخلوط گردید و مالئیک انیدرید پلی پروپیلن به عنوان ماده سازگار کننده (جفت کننده) در یک سطح ثابت و برابر با 5% وزنی مورد استفاده قرار گرفت. نسبت ماده زمینه (پلی اتیلن سنگین) به ماده لیگنوسلولزی 60 به 40 در نظر گرفته ‎شد. نمونه های نهایی پس از ترکیب در یک اکسترودر دو ماردونه، گرانول گیری و در ادامه با استفاده از روش قالبگیری تزریقی تهیه و برای انجام آزمایشات آماده شدند. مقاومت های مکانیکی چند سازه های تولید شده شامل مدول خمشی و کششی، مقاومت خمشی و کششی، مقاومت به ضربه فاق دار و خواص فیزیکی شامل جذب آب و واکشیدگی ضخامت پس از 24 ساعت طبق استاندارد های ASTM اندازه گیری شدند. نتایج نشان داد که تیمارهای شیمیایی در مقایسه با ماده لیگنوسلولوزی خام به ترتیب باعث افزایش و کاهش مدول الاستیسیته خمشی در چندسازه های تقویت شده با باگاس و کلش برنج شدند. درحالیکه تیمارهای اشاره شده منجر به افزایش مدول الاستیسیته کششی در چندسازه های تقویت شده با هر دو نوع ماده لیگنوسلولوزی شد. مقاومت خمشی و کششی چندسازه های حاوی باگاس بیشتر از چند سازه های تقویت شده با کلش برنج بود و تاثیر تیمارها نیز بر روی باگاس بیشتر از کلش برنج بود. چندسازه های حاوی کلش برنج مقادیر مقاومت به ضربه، جذب آب و واکشیدگی ضخامت بیشتری را در مقایسه با چند سازه های تقویت شده با باگاس از خود نشان دادند. همچنین تیمارهای انجام شده باعث کاهش جذب آب و واکشیدیگی ضخامت در چندسازههای حاوی هر دو نوع ماده لیگنوسلولوزی شد. Kord, B., Kord, B., Purabasi, S. and Kyayefar, A. 2010. The Effect of Content and Type of Reinforced Lignocellulosic Material on the Pysical and Mechanical Characteristics Wood-Plastic Composite. Journal of Sciences and Technical of Natural Resourses, 20(3):57-68. (In Persian). Gorokhovsky, A.V., Escalante-Garcia, J.I., Gashnikova, G.Yu.,Nikulina, L.P. and Artemenko, S.E., 2005. Composite materials based on wastes of flat glass processing. Waste Management. 25(7):733–736. Panthapulakkal, S. and Sain, M., 2007. Agro-residue reinforced high-density polyethylene composites: fiber characterization and analysis of composite properties. Composites Part A. 38(6):1445–1454. Wang, Y.C., Wong, P.M.H. and Kodur, V., 2007. An experimental study of the mechanical properties of fibre reinforced polymer (FRP) and steel reinforcing bars at elevated temperatures. Composite Structures. 80(1):131–140. Allahdadi, M., Hejazi, S., Jonoobi, M., Abdolkhani, A. and Jamalirad, L., 2016. Effect of Bagasse Chemical Pulping and Coupling Agent on the Physical - Mechanical Properties of Composites Based on Bagasse pulp/Low density polyethylene. 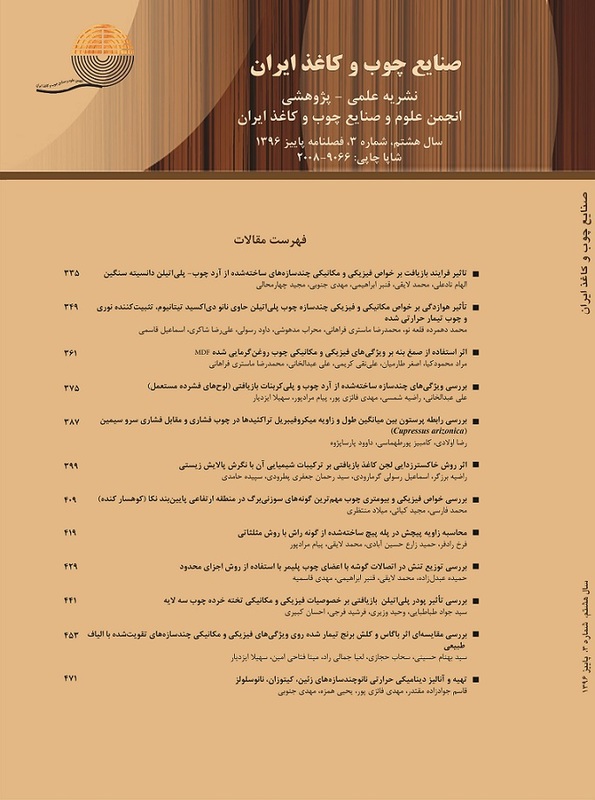 Iranian Journal of wood and paper industries, 7(3):349-362. (In Persian). Mechraoui, A., Riedl, B. and Rodrigue, D., 2007. The effect of fibre and coupling agent content on the mechanical properties of hemp/polypropylene composites. Composite Interfaces, 14(7-9):837-848. Arbelaiz, A., Fernandez, B., Cantero, G., Llano-Ponte, R., Valea, A. and Mondragon, I., 2005. Mechanical properties of flax fibre/polypropylene composites. Influence of fibre/matrix modification and glass fibre hybridization. Composites Part A: applied science and manufacturing, 36(12):1637-1644. Najafi, S., Tajvidi, M. and Hamidina, E., 2007. "Effect of temperature, plastic type and virginity on the water uptake of sawdust/plastic composites." Holz Roh Werkst, 65:377–382. Razavi-Nouri, M., Jafarzadeh, F., Oromiehie, A. and Langroudi, AE., 2006. Mechanical properties and water absorption behavior of chopped rice husk- filled polypropylene composites. Iranian polymer Jour, 9:757-766. (In Persian). Tong, J.Y., Royan, N.R.R., Ng, Y.C., Ghani, M.H.A. and Ahmad, S., 2013. Study of the mechanical and morphology properties of recycled HDPE composite using rice husk filler. Advances in Materials Science and Engineering, 2014:1-6. Maldas, D. and kokta, B. R., 1989. Improving Adhesion of wood fiber with polystyrene by the chemical Treatment of fiber with a coupling Agent and the Influence on the Mechanical properties of composites. Journal of Adhesion Science and Technology, 3(7):529-539. Hill, C., 2006. Wood Modification: Chemical, Thermal and Other Processes, John Wiley and Sons Ltd, 260 p.
 Rowell, R.M., 1975. Chemical modification of wood: Advantages and disadvantages, Proceedings Am. Wood Preservers Association, 1-10. Militz, H. and Beckers, E.P.J., 1994. Process for acetylating solid wood. European Patent Application, 85850268.5. Evans, P.D., Wallis, A.F.A. and Owen, N.L., 2000. Weathering of chemically modified of scote pine acetylated to different weight gains. Wood science and technology, 34(2):151-165. Kord, B. and Taghizadeh Haratbar, D., 2014. Influence of fiber surface treatment on the physical and mechanical properties of wood flour-reinforced polypropylene bionanocomposites. Journal of Thermoplastic Composite Materials, 29(7): 979-992. Wang, L.K., Wang, L., Chen, Y. and Zhang, C.H., 2005. Preparation, morphology and thermal/mechanical properties of epoxy/Nano clay composite. Composites Part A: Applied Science and Manufacturing, 37(11):1890-1896. Shakeri, A. and Hashemi, S.A., 2002. The physical properties and topography of the composite material made using paper fibers and high density polyethylene. Journal of Agriculture and Natural Resources, 9(1):171-182. Li, x., Tabi, L.G. and Panigrahi, S., 2007. Chemical treatment of natural fiber for Use natural fiberreinforced composites: A Review. Journal of Polymers and the Environment, 15:25-33. Lee, Y.H., Sain, M., Kuboki, T. and Park, C.B., 2009. Extrusion foaming of nano-clay filled wood fiber composites for automotive applications. Journal of Material and Manufacturing, 1:641-647. Ghofrani, M., Pishan, S., Mohammadi, M. R. and Omidi, H., 2012. A study on rice husk/recycled high density polyethylene composites-their physical and mechanical properties. Environmental Sciences, 9(1):99-112. Najafi, A., 2015. Chemical treatment of rice husk with acetic acid as substitute for MAPE in rice husk/high density polyethylene composite. Iranian Journal of Wood and Paper Science Research, 30(3):443-456. (In Persian). Mishra, S., Misra, M., Tripathy, S. S., Nayak, S. K. and Mohanty, A. K., 2001. Graft Copolymerization of Acrylonitrile on Chemically Modified Sisal Fibers. Macromolecular Materials and Engineering, 286(2):107-113. Kokot, S. and S. Stewart, 1995. An Exploratory Study of Mercerized Cotton Fabrics by DRIFT Spectroscopy and Chemometrics. Textile Research Journal, 65(11), PP: 643-651. Garcia-Jaldon, C., Dupeyre, D. and Vignon, M. R., 1998. Fibres from semi-retted hemp bundles by steam explosion treatment. Biomass Bioenergy, 14:251-260. Chow, C.P.L., Xing, X.S. and Li, R.K.Y., 2007. Moisture absorption studies of sisal fiber reinforced polypropylene composites. Composites Science and Technology, 67:306-313. Espert,A., Vilaplana, F. and karlsson S., 2004. Comparison of water absorption in natural cellulosic fiber from wood and one-year crops in polypropylene composites and its influence on their mechanical properties.Composites: part A, 35:1267-1276.